The main goal of every marketer is to spread the word of their brand and to hope their content goes viral. But those in the industry know viral marketing is much easier said than done. Marketers turn to social media to get their message out, but what does it take to push it to the next level? Viral marketing is a style of product promotion that relies on an audience to generate the message of a product or service to point where it rapidly breaches out to friends and family in a short period of time. If acheived, your specific message will be in nearly everyone’s social media feed. All of you eager marketers out there read this and think if only there was a way to tackle viral marketing. However, what if there was a way to master viral marketing and on top of that, it isn’t that difficult? Old Spice continues to be the gold medalist of viral marketing with their humorous and odd-ball efforts. With “The Man Your Man Could Smell Like” campaign in 2010, their ad received more than 52 million views and continues to be a marketing theme for the company. Simply put, great content is great content. Your audience will be able to read right through you if you’re trying too hard. Even if it seems impossible, you can follow these steps to get on the right path to larger share counts, audience growth and social buzz. Viral marketing is difficult, but not impossible. You have to start by using the tools around you to build a campaign that will catch fire. The first step to viral marketing is to know what has and has not worked in the past. This will not always be the tall-tale answer to your ability to go viral. Instead, turn to numbers to get a better understanding of what it takes to go viral. Each of these social media metrics can give you insight into what pieces of content have performed the best on your social media pages. Using a social media publishing tool helps you easily overview each platform so you can shed light on your content’s performance. From there, you can start to build your viral marketing campaign on the right social media network and with the ideal piece of content. One of the biggest problems of companies attempting to go viral is not knowing why they want to be in everyone’s social media feed. You have to have a plan of action with your viral content and it has to be purposeful. A lot of marketers will argue that viral content simply has to catch on in whatever way possible, but this could backfire. For example, possibly the most viral marketing campaign to come from this year’s Super Bowl was Mountain Dew Kickstart’s Puppymonkeybaby. This bizarro commercial went in with a mission to essentially get weird and get recognized by everyone. While nearly everyone knows the product Mt. Dew, they might not all know their newest energy drink Mt. Dew Kickstart. However, more than 23 million views later on YouTube, a lot of people are still asking what in the heck is Puppymonkeybaby, but now know Mt. Dew Kickstart. While some might feel it’s bad to create “nightmare-inducing” content, more likely than not, Mt. Dew’s mission to go viral was completed by knowing the brand sought out to be weird, bizarre and make people (fearfully) scratch their heads. This might seem completely obvious, but you have to make sure your content is optimized to be easily shared. Make sure that you encourage the content to be shared on social media so it has a better chance at going viral. Your newest campaign won’t likely go viral if it only exists on your blog. Instead, try to use all social media channels that will work best at promoting your content. For example, if your content is an image, try Facebook, Twitter and Snapchat. However, if you’re trying to include a viral video, you’ll be better off with YouTube, Instagram and Vine. Providing several different routes to share. Giving away free products or services. Find the common motivations of your main audience. Ask questions that get viewers or readers thinking. Scale your campaign to move from small to large. Never restrict or gate your content. Always used its campaign called #LikeAGirl to really ask the question what it means to do something “like a girl.” The company’s engaging, thought-provoking video managed to get more than 61 million views on YouTube and the hashtag was shared thousands of times through the early stages of the campaign. Using hashtags to go viral is a fantastic way to help spread the word of your content. Just ask Coca-Cola who started the #ShareaCoke campaign to advertise its new branding. The major soft drink company began using names on Coca-Cola bottles and cans to inspire sharing with friends and loved ones. The hashtag easily inspired customers to take pictures with the can or bottle and post it on social media. According to the American Marketing Association, the campaign drove in 28% more customers than the previous year. Additionally, the hashtag #ShareaCoke was used more than 250,000 times just during the campaign cycle. A more popular way for marketers to get their content seen is by trendjacking. This social media term means to hop on a meme, relevant pop culture subject or some other viral piece of content to promote your business. This is quickly becoming one of the staple marketing practices for those trying to get a piece of the viral market. The most popular meme right now is the “Damn, Daniel” video, which is just a short group of Snapchat videos of one teenager complimenting a friend on his shoes. However, the shoes he mentions a few times are Vans, who is now rumored to be working on a commercial with the creators of the meme. Even Van’s Instagram account is is literally filled with “Damn, Daniel” comments. Fiat also recently ran a commercial with a groundhog for its 2016 500X, which proclaimed that six more weeks of winter isn’t so bad. At the end of the commercial, a groundhog yells out. This video is memejacking the “Screaming Marmot” video that went viral when someone dubbed a man screaming overtop of the animal’s yelp. When Fiat combines the meme with its ad, the company is able to get the roughly 700,000 views on YouTube for being relevant. Brands tend to see a lot more shares when their content is humanized or at least seems genuine from the company. According to Marketing Land, viral success is hard to achieve, but when you’re authentic with your message, your content is more shareable. Also, a KissMetrics infographic explained how engaging with your audience during your viral campaign can help content gain more traction and attention. Millennials continue to be the center of attention for marketers, but figuring this group out has not come easy. However, studies have shown that humanizing your brand is a great way to seem relatable and less corporate. Nearly half of millennials consider brand reputation to nearly as important as a peer recommendation. Social advertising was the most trusted channel by 36% of millennials. Roughly 40% of millennials avoid brands that don’t have mobile or social channels. 44% of millennials said they wanted open dialogue with customers through social media. The last stat above is one of the most telling for businesses who want to go viral. The more open communication you have with your customers, the likelier you’ll be able to get them to engage with your campaign. 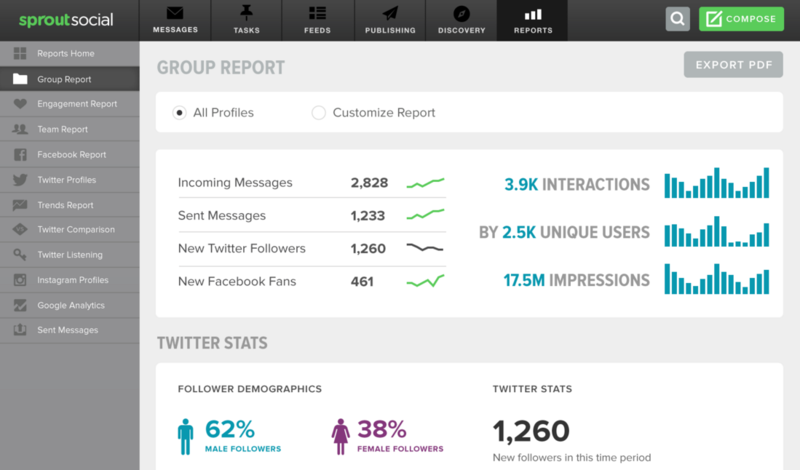 Using Sprout Social’s social media engagement tools can help you stay on top of all incoming messages to your brand. Additionally, you can use message tagging features to identify whether or not your messages or customer messages are related to a specific campaign. Going viral is still one of the most difficult things to do as a marketer, but by following these steps, you will only improve your engagement and social media interactions with your content.